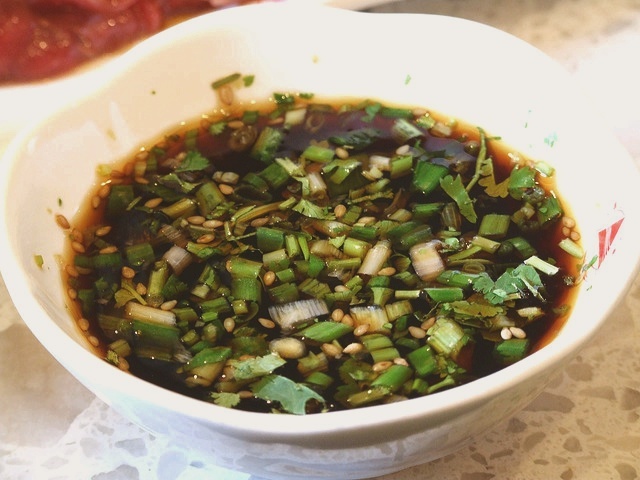 This vinegary dipping sauce enhances the taste of grilled foods or raw vegetables. It can also be used as a marinade for meat, poultry or seafood to be grilled or as a dressing for salads. This sauce keeps well in the refrigerator. In a bowl, whisk together rice vinegar, root ginger and soy sauce. Beat in sugar until it has dissolved. Stir in sesame oil, garlic, spring onions, chilli powder, and put aside for 1-2 hours to allow flavour to mingle before serving. Garnish with roasted sesame seeds to serve.